Welcome to the new custom revolution! Just in time for its 115th anniversary, Harley-Davidson introduces eight completely new Softail models, a successful synthesis of the performance of previous Dyna models and the classic look of the Softail range. The new model family was designed as part of Harley-Davidson’s longest product development program to date. The new machines have a stiffer and much lighter frame, incorporating the high-torque and two-balance Milwaukee-Eight 107 or Milwaukee-Eight 114 engines. With their powerful Dual Bending Valve fork and concealed and easily adjustable strut, the attractively styled 2018 Softail models are faster, lighter and handier than any of their predecessor models. Although the time of year does not suggest it, Thunderbike is booming. Night shifts, weekends, holidays, nothing is sacred to the boys at the moment to make the impossible possible. Our goals are ambitious: Incredible 14 custom bikes based on the new Softail Generation 2018 should be put into action in less than 10 weeks to present them LIVE on the Custombike Show in Bad Salzuflen. Of course, the selection must be a cross section of all styles, so there is something for every taste. We want to show you that the new Softail models not only work better on the road, but also create extremely cool customs. All of our bikes were made for our showroom and can be bought and taken with you directly – so to speak “Custom2Go” at Thunderbike. To do justice to the brand’s history and authenticity, the eight 2018 softails interpret the respective model DNA in a very individual, yet always recognizable yet refreshingly different and modern way. 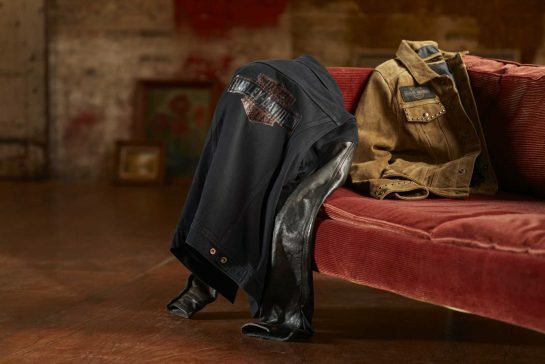 They offer more style, comfort and performance than ever and are also ideal for customization with original Harley-Davidson accessory products. The new, lighter and stiffer frame gives the 2018 Softail models a much improved ride. Retaining the classic look of a rear-wheel unsprung motorcycle while still offering state-of-the-art chassis comfort at the highest level, it combines form and function in an almost ideal way. The benefits of the new chassis include more precise steering, agile handling and lower vehicle weight, which contributes to better acceleration. With many models, it has been possible to increase the tilt angle and also makes it easier for the driver to lift the machine from the side stand to the vertical. The redesigned frame – not least thanks to the increased carbon content in the steel – could be designed to be torsionally stiff by around 65 percent compared to its predecessor model year 2017. In combination with the redesigned swingarm, it contributes to making the entire chassis stiffer by around 34 percent as that of the predecessor types. In addition, it scores with reduced complexity, namely with a 50 percent reduction in its components and about 22 percent fewer welds. Harley-Davidson combines the frame with two different wings: one for narrower and one for wider rear tires (Wide). The “Wide” chassis is 5.89 kg (15 percent) lighter and the “Narrow” chassis weighs 8.16 kg (20 percent) less than the chassis of the previous models. The swingarm is supported by a central spring leg towards the frame. It is hidden under the seat of the observer’s eye, preserving the classic lines of a rigid frame. Also new is the fork. It has the “Dual Bending Valve” technology that Harley-Davidson 2017 first used on Touring models. It improves damping behavior over the entire rebound and rebound interval. The construction is just as powerful as a conventional cartridge fork, but is easier. With a travel of 130 mm it offers an ideal synthesis of comfort and dynamic qualities. For improved handling of the new Softail models also contribute a modified steering head angle and caster. Thanks to the new chassis geometry, the driver always has the machine under perfect control. Combined with the fork, the new center strut absorbs all road bumps to keep the bike as steady as it is stable. Its spring base can be easily adjusted. A maximum payload of up to 217 kg guarantees sufficient capacity for passenger and luggage in all driving situations, while ensuring high comfort and easy handling. Depending on the model, the new Softail types are up to 17 kg lighter than their respective predecessors. The optimized power to weight ratio is reflected in a more powerful acceleration, better braking performance and a more dynamic handling in curves – especially as in almost all models, the tilt freedom could be increased. Selected models have been fitted with new tires specially optimized for use in the new Softail chassis. The Softail models are also made from new materials and have been redesigned to give a Softail a wider range of body sizes. The Softail models will be powered by the Milwaukee-Eight 107 or the Milwaukee-Eight 114 engine in model year 2018 – the most powerful engines used to date in a Harley-Davidson chopper or cruiser. As a V2 with a powerfully protruding cylinder angle of 45 degrees and a slim crankcase and a lower camshaft, the Milwaukee Eight retains the classic design of the Harley-Davidson engines despite its many modern features. The V2 is rigidly connected to the Softail frame. The mounting points have been redefined in order to integrate the engine as compactly as possible into the frame and to increase the chassis rigidity. Thanks to its balancer shafts, the engine’s vibrations are reduced to the level that Harley-Davidson riders appreciate. Since the engine has been damped on the intake side and is mechanically very quiet, its typical Harley-Davidson sound comes into its own. Available on request in selected models. *Prices listed are the Manufacturer’s Suggested Retail Prices include tax for base models. Options such as color are available at additional cost. Prices exclude title, licensing, registration fees, destination charges, added accessories, and additional dealer charges, if any, and are subject to change. Here you will find all details about Specs and Prices.